For this issue of Best Practice, we are incredibly proud to announce UNISIG as our Deep Hole Drilling Company of the Year. First established in 1981 by the Swiss Industrial Group (SIG) and the US Company United Technical, UNISIG is the leading provider of the complete deep hole drilling system. In 1995 it was taken over by Entrust Manufacturing Technologies Inc and went from strength to strength, amassing a number of achievements along the way. With their range of specialist services, the company facilitates advice, services and products across the Deep Hole Drilling Machine Industry. Since being acquired by Entrust, UNISIG have boomed in terms of innovation and expertise, with Entrust investing extensively in the future development of UNISIG deep hole drilling machines and products. Bringing a new perspective and ideas, Entrust have tested the limitations and capabilities of new products through in-depth processes, ensuring their products are as high quality and long lasting as their clients have come to expect. UNISIG offers machines, tools and automation systems that fulfill any Deep Hole Drilling purpose required by their customers. With their equipment, they are able to create precision parts with unmatched levels of accuracy. Producing high performance equipment and components, whilst applying a variety of standards such as, ISO, DIN and AGMA, means UNISIG use only those components that have proven effectiveness and global demand. A note-worthy feature within their range is their B-Series Rack and Pinion drive machines. 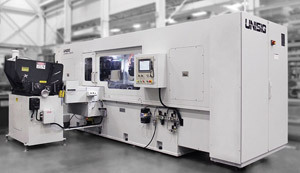 Providing an endless amount of capabilities, the B-series machines deliver a full deep hole drilling system, perfect for manufactures requiring the largest dimensions. These series use BTA, (a process that accurately drills precise holes from 20 – 630mm in diameter), alongside other tools that produce centre line holes in round parts. 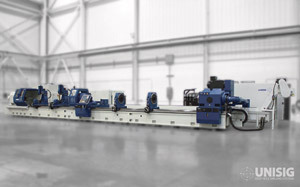 Built to uphold their customers’ high standards whilst solving industry challenges, UNISIG’s B-series Rack and Pinion driven machines are made of powerful drives and durable components, making this series a valuable investment for deep hole drilling needs. UNISIG’s vast global customer base has expanded immensely with rapidly rising interest across the Americas, Europe and Asia. 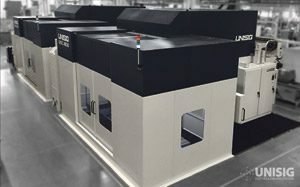 Manufactured in the USA, UNISIG’s head office, engineering centre and production centre is based in Menomonee Falls, USA. Advertising globally, UNISIG also have a European sales and support office based in Germany. An upcoming appearance for UNISIG within Europe is the IWA OutdoorClassics event on the 8th-11th March 2019 at the Exhibition Centre in Nuremberg. IWA OutdoorClassics is a world-leading trade fair for hunting, shooting sports, equipment for outdoor activities and civilian/official security applications. The show houses the top acknowledged manufactures and traders, showcasing the best in the business in terms of products and machinery. Through consistent growth, investments and innovative ideas, UNISIG has gone from strength to strength, building a strong reputation for supporting their clients in completing the most challenging of projects. For any further information please feel free to visit their website or alternatively, to speak to them directly, please call them on the number stated below.